It’s been a long time since I had either the time, or the mental capacity to write up a new post on my blog. I think it’s safe to say that PNG looks good on us sometimes, but it isn’t without it’s challenges.We’ve now been here for the past 4+ years, and on reflection – it’s been a hell of a journey. Boarding School! holy *@#$… She’s a teenager! We came to PNG for a 3 year adventure, it’s turned into something unexpected, but that’s what you should expect in the Land of the Unexpected. Jacinta still pines for home, but she is making the most of being able to spend time with the kids, and my job just keeps on changing. I started here managing a small team, and now have over 40 staff and a bunch of different departments to look after. Each part of your working life here in Moresby has different challenges, and mines no different. One minute I am dealing with no power (actually that happens every day), but seriously, no power, and a genset that keeps shutting down, likely to continue on for a few weeks as they try and retrofit parts to an aging and obselete main switchboard, the next minute helping someone with a mobile phone who’s only form of power is that which is at work. The past 4+ years have been very eventful. We’ve been apart of some pretty amazing things; being part of a brideprice ceremony; watch a volcano erupt; seeing a country go through 40 years of independence; watching the 15th Pacific Games in Moresby; Swimming in water warmer than the bath; Fishing in amazing waters; eating the most amazing food; having the most amazing travels. We’ve also seen some horrible things; the gang bashing of a man and boy in East New Britain; the death of 2 little kids as they were thrown from the back of a ute at high speed; our neighbour getting vicously carjacked outside our door; the women that come to work with black eyes and sad hearts; the broken hands; the broken lives; the violence that lives just around the corner; the violence that poverty and hardship create. But I see a country of resilience, of fight, and of swagger. A country not afraid to stand up for itself, and a country of hope. A country that is changing; rapidly; modernising. A country that is standing up and shouting “look at us – we are here”. A country that is no longer tolerating domestic abuse; no longer tolerating unlawfulness. But a country that sometimes slips back into previous times; a country that is trying hard, but needs help. We’ve been lucky, here. We’ve faced a few obstacles, but prevailed. The kids keep laughing at me for breaking fingers and toes, 2 fingers, 1 toe in the past 2 years – not sure how that happens, but it does. I seem to have a way of tripping over anything that isn’t bolted down. This year, on top of the malaria I got a few years ago – I got the dreaded Dengue Fever. What a drama that was; being misdiagnosed with malaria, then misdiagnosed with Hepatitis, before finally being flown down to Cairns. Dengue is the worst illness, they don’t call it breakbone fever for nothing, it feels like your whole body is snapping in half. Thankfully, we haven’t contracted TB. But we are trying to help those that have. PNG has some of the highest rates of TB in the known world, and we are raising funds for Kikori Hospital in their fight against this devestating illness. I think living here, we (and certainly the kids) have lost our materialism, but enjoy the good things, a nice meal, travel, hearing the rain, being on the water, getting some sun. We still collect lots, but we give away as much as we get. Our’s isn’t a life where we sell a cup for a couple of dollars, ours is giving it a new home. I noticed the other day when we were at the Ela Beach Craft Markets, we didn’t bargain once. The vendors named a price, if we liked it, and liked the price – then we bought it. If we didn’t, we didn’t haggle them down – we just moved on. I think everyone knew 🙂 Some of the market vendors are people that see us, and wave – not because we are a prospective sale, but because they have seen us over and over again. The street sellers all know us by name, and people come up to us in the street to say hi (then you recognise them as the guard at work, or the girl at the chemist). We now have unlimited internet – although it’s very slow. But if you want highspeed, you can get it – for a price. There are 2 movie theatres, showing movies before they are released anywhere else (in 3D too). Flights to Singapore, Hong Kong, Japan, Cairns, Brisbane, Sydney, Solomons, Vanuatu, Fiji – lets hope someone does New Zealand soon! But also a huge amount of internet tourism places with cruise ships coming in and of course some of the best diving in the world. 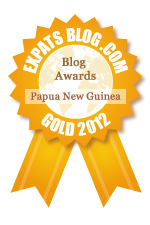 Yes – PNG is changing. But like 4 years ago, you can still get carjacked, you need to keep your wits about you at all times, and if you do that – you can have the most wonderful experiences ever. And we lose so many of them… It’s hard, saying goodbye. But we will always remember, the parties, the good times, the sad times, the frustration and the anxiety. Living here gives you all that and more – but we all dread the end, the go pinis bbq’s, the lack of another place to go. And as we live here for longer, the new expats that arrive seem to be too scared to say hello, some of them don’t fit in, sometimes we don’t fit in as well. But still we create friends for life.